There was a battle, around 14,000 kilometers away from Australia, exactly 101 years ago, where more than 8,000 Australians died and around 18,000 wounded. It was a tremendous military disaster and a shattering moment for Australia. The landing at Gallipoli peninsula (now Gelibolu in modern Turkey) on 25 April 1915 was a miserable failure; it did not make any significant change to the path of history in World War 1, apart from causing major casualties on both sides. Yet the Australians embrace the memories of the defeat. The legendary 25 April was named as Anzac Day and became a national public holiday. Anzac stands for the Australian New Zealand Army Corps, the name given to the combined troop of the two nations formed during the Great War. What happened in Gallipoli was a heroic tale to be sung, a symbol of Australian’s bravery, and a splendid display of triumphant endurance in the face of the strong and determined opposing troop. Books were written to tell the story on how the Battle of Gallipoli has shaped the sense of nationhood of the two newborn young countries at that time. Movies were made depicting the mateship and loyalty of the young Australian soldiers. A Dawn Service is held each year on 25 April in remembrance of those who had sacrificed and suffered. 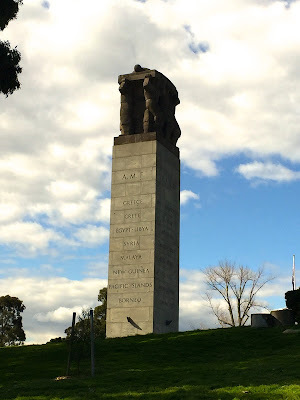 In the state of Victoria, the solemn ceremony is held at the Shrine of Remembrance, an impressive Greek-style mausoleum inspired by the Tomb of Mausolus built in the Southern Greece around 300 BC. The entrance was aesthetically modified from the architectural style of the Parthenon in Athens, where eight imposing Doric columns with circular capitals can be clearly seen from afar. At each of the east and west walls of the building, there is a buttress sculpture of a courageous female figure standing proudly on a chariot drawn by a pair of lions, with a small child standing in between. The plan of constructing the majestic structure in commemoration of the 19,000 deaths in World War 1 was no lack of criticisms at the time when it was first commissioned. Some questioned the necessity of the significant expense to be spent on the shrine, contending that the funds could be better used in other charitable projects. Some attacked the absence of beauty of the design, and some pointed out the seemingly paganism link of the structure. Yet despite the Great Depression and the conflicting noise, millions of ordinary families contributed funds to kick-start the construction. Sidney Myer personally donated $5,000 to the work. The building of the shrine was completed in 1934. Today, the Shrine of Remembrance remains one of the most dramatic structures along St Kilda Road. It stands aloof at the elevated status, visible from all directions, like an obstinate fighter demands to be remembered and refuses to allow the faded history to be forgotten.